Dubai & Riyadh (May 15, 2018) – Following the news that Saudi Arabia’s Ministry of Culture and Information will be opening up the Kingdom to movie theatres in 2018 for the first time in 35 years, IMAX Corporation and VOX Cinemas, the Middle East’s largest and most rapidly growing cinema exhibitor, today announced a sales agreement for a minimum of four new IMAX® theatres in Saudi Arabia. Four theatres will be added to new multiplexes in Riyadh and other prime locations at some of the Kingdom’s most prominent shopping malls including those owned by VOX Cinemas’ parent company, Majid Al Futtaim, the leading shopping mall, communities, retail and leisure pioneer across the Middle East, Africa and Asia. VOX Cinemas is the Middle East’s most innovative and customer-focused cinema exhibitor. Owned and operated by Majid Al Futtaim Cinemas, VOX Cinemas is the cinema arm of Majid Al Futtaim, the leading shopping mall, retail and leisure pioneer across the Middle East and North Africa. With 33 cinema complexes totalling 322 screens across the region, including 163 screens in the UAE, 15 screens in Lebanon, 47 screens in Oman, 30 screens in Bahrain, 28 screens in Egypt, 17 in Kuwait and four in KSA, VOX Cinemas is now the Middle East’s largest and most rapidly growing cinema exhibitor. The company is undergoing a 1.2 billion Dirham investment that will see the company expand to operate 600 screens across 50 locations in the region by 2020. Tailoring every cinema location to the surrounding market place and customer preferences, VOX Cinemas offers a mix of cinema experiences including two luxury cinema concepts, THEATRE by Rhodes and GOLD by Rhodes which are collaborations with Michelin-starred Chef Gary Rhodes. 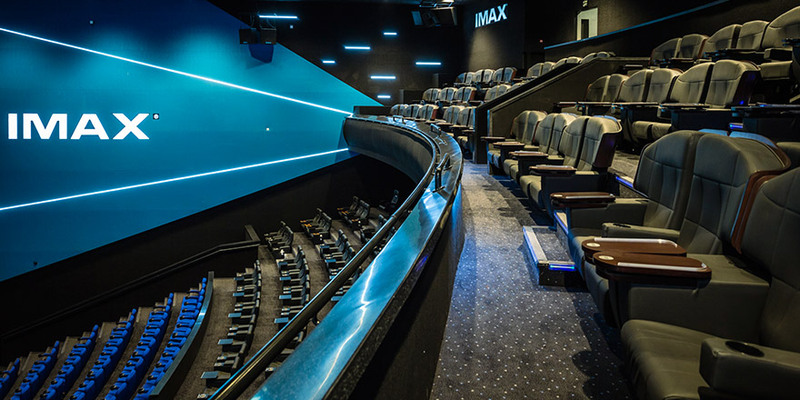 Taking the MAX big screen cinema to the next level, VOX Cinemas currently operates the Middle East’s largest cinema screen in the region at the Virgin Radio MAX screen in City Centre Deira in Dubai. VOX Cinemas also has the very first and only IMAX with Laser screen in the Middle East, holds the Middle East’s exclusive rights to the immersive 4DX experience, and operates KIDS, the very first cinema in the Middle East dedicated to kids having fun. VOX Cinemas also recently introduced OUTDOOR, the first open air VOX Cinemas in the region located on Galleria Mall’s Rooftop in Dubai for the cooler months of the year. Founded in 1992, Majid Al Futtaim is the leading shopping mall, communities, retail and leisure pioneer across the Middle East, Africa and Asia. A remarkable business success story, Majid Al Futtaim started from one man’s vision to transform the face of shopping, entertainment and leisure to ‘create great moments for everyone, every day’. It has since grown into one of the United Arab Emirates’ most respected and successful businesses spanning 15 international markets, employing more than 40,000 people, and obtaining the highest credit rating (BBB) among privately-held corporates in the region. Majid Al Futtaim owns and operates 22 shopping malls, 12 hotels and three mixed-use communities, with further developments underway in the region. The shopping malls portfolio includes Mall of the Emirates, Mall of Egypt, City Centre malls, My City Centre neighbourhood centres, and four community malls which are in joint venture with the Government of Sharjah. The Company is the exclusive franchisee for Carrefour in 38 markets across Middle East, Africa and Asia, and operates a portfolio of more than 230 outlets in 15 countries. Majid Al Futtaim operates over 300 VOX Cinema screens and 32 Magic Planet family entertainment centres across the region, in addition to iconic leisure and entertainment facilities such as Ski Dubai, Orbi Dubai and Ski Egypt, among others. The Company is parent to the consumer finance company ‘Najm’, a fashion retail business representing international brands such as Abercrombie & Fitch, AllSaints, lululemon athletica, Crate & Barrel and Maison du Monde; and a healthcare business that operates City Centre Clinics. In addition, Majid Al Futtaim operates Enova, a facility and energy management company, through a joint venture operation with Veolia, a global leader in optimised environment resource management. The Company also owns the rights to The LEGO Store and American Girl in the Middle East and operates in the food and beverage industry through a partnership with Gourmet Gulf.